"Smooth and easy transaction. Nikki was very helpful and easy to talk to. " 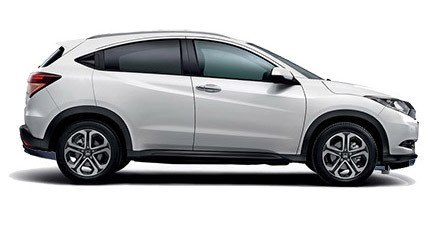 Read our customers' honest and impartial Honda HR V car reviews and ratings to easily find your next car at Motorparks. The car is lovely and I am enjoying driving it. I feel very safe with all the safety features that are installed and the road handling is superb. Having driven it for about six weeks, I have to say I am very pleased with it. Have had one long drive down to Devon and back and it performed really well. Petrol consumption was very satisfactory. Particularly impressed with the excellent acceleration when overtaking etc, and the comfort of the seats, both of which I was looking for when purchasing the HR-V. The operation of the entertainment system and the operation of the hand brake button take a little bit of getting used to, but fine with them now. Love the blue with hint of purple colour of the vehicle. Overall very pleased with the H-RV. Masses of room inside but the outside is relatively compact which I like, the boot is the biggest I've seen on this size SUV. The inside is very comfortable with all the gadgets you could want or need. I have the automatic gearbox which has a smooth change but feels quite slow to pull away although I could use the sport gear and paddles if needed, also this is probably because my last car was small and 185bhp so the Honda will take a little getting used to. Slightly noisy when driving but just turn up the music! Brilliant on fuel consumption. I would definitely recommend. Having had Honda's before, I have recently purchased a 2017 HR-V manual. It simply does everything a Honda should do. Impressive safety measures, up-to-date equipment and great space. Two failings are no spare wheel and disappointing fuel consumption, despite using the Econ button. Despite this, it is a very pleasing car to drive with a slick manual gearbox. A very nice car, with lots of safety features and a stylish exterior and interior. A good driving experience and very comfortable.